The NHS is closed and defensive – reflections from James Titcombe on the eve of the Kirkup inquiry findings. In 2008 James Titcombe found that the NHS complaint process was a closed and defensive system. In the immediate aftermath of Joshua’s death, I didn’t know much about the different organisations involved in healthcare regulation. I found out the hard way that every organisation I turned to either refused to help or failed to do what might have reasonably been expected. Unfortunately, for all of us, nothing much has changed since 2008 and those with responsibility to regulate still look the other way denying justice and remedy and putting other lives in danger. When did it become acceptable for those with responsibility to deny accountability? In the next few weeks we are finally set for a moment of truth that myself and other families have been long waiting for. The Morecambe Bay Investigation report will finally be published next month. These are personal reflections only. At the time of writing, I do not know what the reports conclusions are going to be. I don’t wish to speculate on what the specific findings might be. Firstly, I have to mentioned the issue of ‘bad news’ about the NHS and politics – something I’ve talked about before. When the scale of problems at Morecambe Bay eventually did start to emerge (in late 2011/early 2012), I started to think about why problems hadn’t been identified sooner and why, back in 2008 when Joshua died, myself and other families faced such a closed and defensive system. I read about the events at Mid Staffs and recognised some of the themes as being relevant to what happened at Morecambe Bay. I also found some documents that made me really concerned about the Ombudsman’s decision not to investigate Joshua’s death and what else was going on around this time. Later on, I became aware of some of the evidence that was submitted to Francis. I referred to some of this evidence in this blog. I’ve noted with interest that the national press have covered some pretty serious allegations and (it must also be said) equally vigorous denials. For example. Any allegation that any Minister could have acted to deliberately keep known problems at Morecambe Bay (or elsewhere) hidden would be extremely serious. I’m sure that this isn’t the case. Given that no Ministers have even been interviewed by the investigation, it’s pretty clear that the Kirkup investigation doesn’t either. It’s important that this minor point doesn’t become a distraction from the really important issues. What still very much remains is a deep concern that at the time Joshua (and others) died, a system wide culture that acted to keep bad news quiet in the NHS had emerged. The fact that such serious issues were happening, involving preventable loss of life on such a large scale, yet the issues remained unaddressed for so long seems to me to be a real indictment of the way the NHS was operating at the time. This brings me to the last few points I want to make. Firstly, I noticed this piece was published in the local paper recently. John, your help was invaluable and hugely appreciated as is your sentiment. However, because I’m concerned about current political manoeuvring, for the record I must draw attention to the fact that for many years myself and other families affected by the failures at FGH did not feel that they had your support. The opposite is the case. Your help (which is hugely appreciated and strong), came only in late 2012 when sadly, the problems at the trust were all too well known. The years following Joshua’s death were lonely, isolated and unsupported and I know this is the experience of other families whose lives have been devastated by these events. The second issue I wish to draw attention to is this article. “Mr Woodcock’s call comes after shadow secretary of state for health Andy Burnham said earlier this month that “the exceptional factors” at the trust meant it would be “an early priority to see if we can put it on a sustainable footing”. In the week when John Woodcock also pronounced on Newsnight “…we’re really proud of the changes we [Labour] made to the NHS”, Andy Burnham talking about putting Morecambe Bay on a ‘sustainable footing’ whilst failing to articulate any understanding of the fundamental reasons why Morecambe Bay finds itself in the situation it does, is pretty hard to swallow. We don’t need to wait for the Kirkup report to have at least a basic understanding of where the problems at Morecambe Bay originate. Significant systemic care quality issues that instead of being identified and dealt with, were left unaddressed by a system that acted in a way that kept the problems hidden. The costs of this have been horrific. First and foremost in human suffering, but the cost to the trust in terms of reputation, additional recruitment, consultancy fees, PR, legal fees, litigation and pay offs to former staff, has been colossal. Yes, there is a debate to be had about tariff adjustments for trusts like Morecambe Bay – but all the money in the world won’t lead to safe and sustainable healthcare if serious problems are covered up. I can’t tell you what the Kirkup investigation will conclude, but I can tell you what it felt like back in 2008 to try and raise awareness of what had happened and get something done. It felt like the whole system was designed to keep people like me quiet and to keep the problems hidden. Sir Brian Jarman has referred to the system at the time as being a ‘denial machine’. 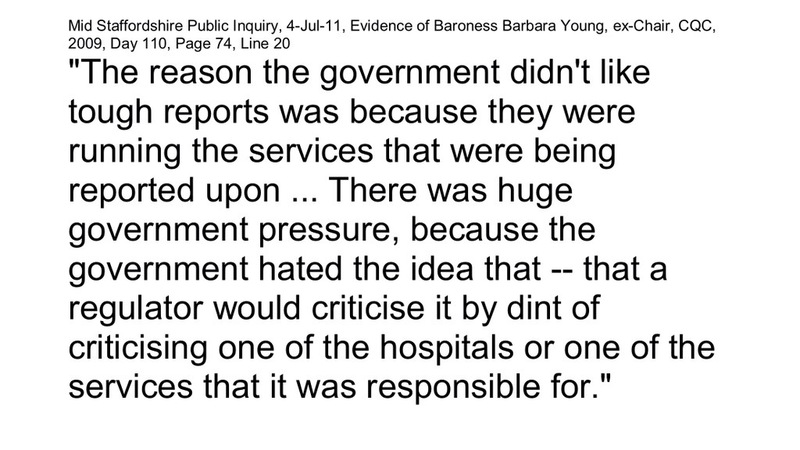 This is what Baroness Young said in her evidence to Mid Staffs. So, before the Kirkup report is published, this is my plea. The NHS is not a ‘weapon’ to be used for political gain, it’s an institute that most of time, we have right to be very proud of. It is also the case that in the past, too often serious problems have been covered up and not addressed. Rather than adopting a political strategy of ‘weaponising’ the NHS, a less toxic (and offensive) approach might be to start an honest dialogue that shows understanding about where things went wrong in the past and demonstrates a commitment to ensure the same failures never happen again. When the Kirkup report is published in the next few weeks, perhaps the very first question some should ask is why it is that we’re only reading the truth about these events now, so long after the serious problems at Morecambe Bay were first happening. My suspicion is that the answer relates more closely to the comments above from Baroness Young than the issue of tariff adjustments. Previous Previous post: Clinical experts needed to drive NHS reform. Next Next post: Whistle blowers and complainants need to be assured of independent complaint handling. How I agree with this………no PHSO investigation for death of my son either. SHAMEFUL! Mr Behrens So should I just be happy that my tenacity has changed things for the better’? Not sure what though!